This is the fastest and easiest DIY Crochet Baby Blanket Pattern you will ever find! When we came across Bernat Baby Mix Yarn, it just jumped into the shopping cart, the pattern idea easily came to mind so that the blanket basically just crafted itself! 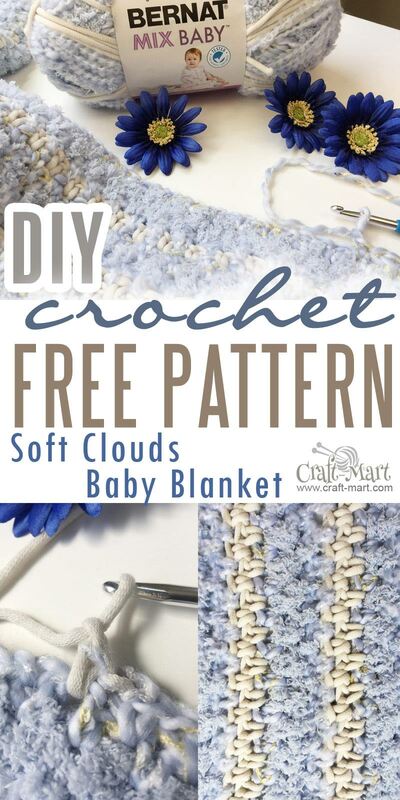 Oh yes, it so simple that even beginners will have no problems crocheting this beautiful, soft, and cuddly blanket in a few evenings or over the weekend, depending on your crochet speed. If you are an experienced crochet master, this is an easy project you’ll love if you are in a hurry to finish a crochet blanket by the deadline. What makes this crochet baby blanket pattern so easy? The texture of the yarn and this simple crochet stitch make the blanket lie flat, so there is no need to crochet a border. If you are not familiar with the Moss Stitch, check our free step-by-step tutorial so you can quickly master this easy stitch and use it in a variety of crochet project: baby blankets, infinity scarfs, shawls, throws, and afghans. Do you have a baby shower date approaching fast? No worries, this is a perfect crochet pattern to meet any deadline. Why do we like Bernat Baby Mix Yarn for Crochet Baby Blanket? The yarn is super soft, chunky, and stretchy making it very ‘forgiving’ for any possible mistakes you can make. What materials do you need for this Easy DIY Crochet Baby Blanket? So, get your yarn and hook ready and let’s begin. Single crochet (SC) into the 4th chain from the hook, * Chain 1, skip one chain. Single crochet (SC) into the next chain. * Continue to the end of the row – the last stitch is single crochet (SC) into the last chain. Chain 2 to turn. Find the first ‘chain one space’ from the previous row and insert your hook there. SC (single crochet) into the 1st chain one space. Chain one, skip single crochet stitch. Single crochet into the next chain one space. * CH 1; SC into chain one space * Continue to the end of the row. The last stitch is single crochet into the last chain one space. Chain 2 to turn. Row 3 and all other rows – repeat Row 2. Weave in the ends from starting new skeins and at the beginning and the end of the blanket. A little tip: as you’ll notice by examining your yarn, Bernat connected all the strands by tightly wrapping a thin strand around two connecting strands which gave us an idea to try it too by connecting 2 skeins together, instead of pulling a new thread when starting on a new skein and weaving the tails at the end of finished crochet project. Though it is a little time consuming, you can take a thin off-white thread and try the same. Looking at your crochet baby blanket fabric, you won’t be able to notice where that connection occurred. Done! Enjoy the soft cuddly goodness of this perfect crochet baby blanket! (You may want to get some more yarn and crochet another blanket, maybe in different colors – to give away as a gift, for future baby showers, etc).